Title of this Iranian video from June 16: Allaho Akbar Arshe Elahi ra be Larze Dar Khahad Avard Gohardasht 26 Khordad. Translated by Lily for the Huffington Post: “They can take our phones, our internet, all our communication away, but we are showing that by saying “allaho akbar” we can find each other.” She ends it my saying that tonight they are crying out to God for help. Just as MLK had to be whitewashed into an image which does not threaten the rule of American tyranny, so too has the true message of Christianity been altered to justify the illegitimate rule of immoral institutions. As has been evident with the recent persecution of Reverend Jeremiah Wright by Democrats and Republicans alike, the United States feels threatened by the liberation theology of Christianity, just as the Roman Empire did during the time of Jesus Christ. Yesterday, the US Energy Information Administration released their estimates of oil production, International Petroleum Monthly, which covers production through November, 2006. 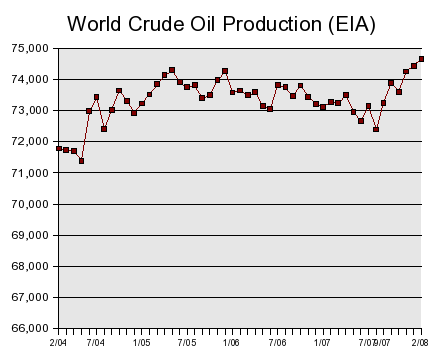 World production of oil, including lease condensate, was 73,410,000 barrels per day, down from the high 74,151,000 bpd which was set in May, 2005. A look at the production chart indicates more of an undulating plateau, but the overall direction over time is down. As a teenager, I could not understand how the German people could claim to be “good Germans,” unaware of what the Nazis had done in their names. I could understand if these ordinary German people had said they had known and been horrified, but were afraid to speak up. But they would then be “weak or fearful or indifferent Germans,” not “good Germans.” The idea that only the Nazis were responsible for the Holocaust made no sense. Whatever the Germans as a whole know about the concentration camps, they certainly knew about the systematic mistreatment of Jews that had occurred before their very eyes, and from which so many had profited. And if they were not really “good Germans,” what should or could they have done, given the reality of Nazi tyranny? BlairWatch has asked bloggers to publish the memos from Craig Murray, Britain’s former ambassador to Uzbekistan, detailing how the Uzbek Secret Forces passed intelligence obtained through torture to the U.K. The documents show complicity in Uzbek torture by both the British and US governments. The neighbor next to Sanat’s World News World Headquarters has a nice Fuyu Persimmon tree. He only picked one shopping bag-full this fall and offered a u pick ’em, all-you-can-eat feast to us, the other neighbors, and most of all, the local population of critters. We picked about four bags and gave them away to friends. 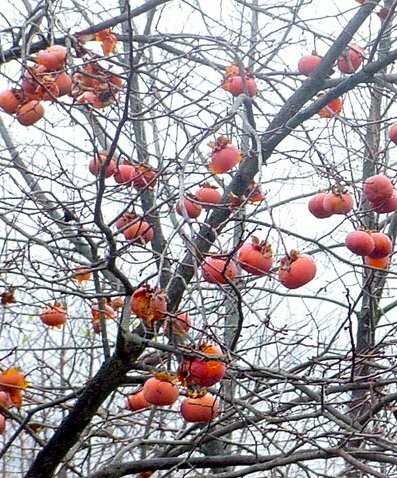 Still, the tree remains full of soft, ripe persimmons. Lots of persimmons. The database classified the Lake Worth meeting as one of more than 1,500 “suspicious incidents” across the country over a recent 10-month period.